The case was brought by the Environment Agency. 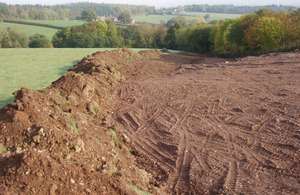 In 2016 Minster Tippers Limited deposited 4,659 tonnes of non-hazardous soil and sub-soil on a field at Poltimore, Exeter. The waste came from development sites around Exeter and was four and a half times the limit allowed by the Environment Agency under an authorisation known as an U1 waste exemption. The maximum limit for soil and sub-soil permitted under a U1 is 1,000 tonnes. The waste was used to level off a substantial part of a field, significantly altering its character and that of the surrounding landscape. The defendant told the Environment Agency that while they had obtained a copy of the site’s U1 waste exemption they acknowledged they’d failed to comply with its tonnage limits. The defendant breached the site’s U1 waste exemption tonnage limit for commercial gain and undermined legitimate waste operators. Companies who deposit waste must check a receiving site can legally accept their waste and that they comply with a site’s tonnage limits. Appearing before Exeter magistrates, Minster Tippers Limited of Combe St Nicholas, Chard, Somerset were fined £7,000 and ordered to pay £3,746 in costs after pleading guilty to an offence under Section 33 of the Environmental Protection Act 1990. The case was heard on 29 October 2018.